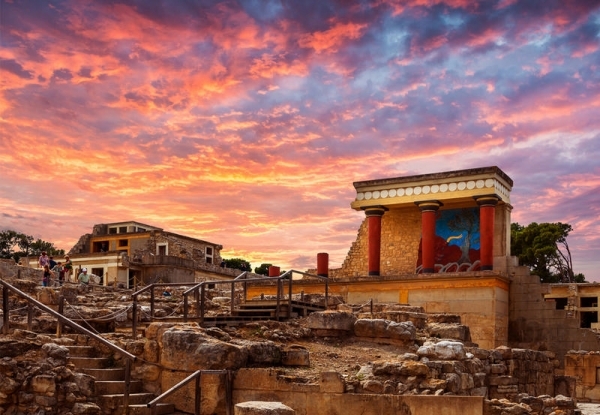 The Minoan palace is the main archaeological site of interest at Knossos, an important city in antiquity, which was inhabited continuously from the Neolithic period until the 5th c. AD. The palace was built on the Kephala hill and had easy access to the sea and the Cretan interior. According to tradition, it was the seat of the wise king Minos. The Palace of Knossos is connected with thrilling legends, such as the Mythology of Crete of the Labyrinth with the Minotaur, and the story of Daidalos and Ikaros. The first excavation of the site was conducted in 1878 by Minos Kalokerinos of Herakleion city. This was followed by the long-term excavations (1900-1913 and 1922-1930) of the Englishman Sir Arthur Evans, who uncovered virtually the entire palace. The earliest traces of inhabitation in the area of the palace go back to the Neolithic period (7000-3000 BC). The site continued to be occupied in the Pre-palatial period (3000-1900 BC), at the end of which the area was levelled for the erection of a large palace. This first palace was destroyed, probably by an earthquake, about 1700 BC. A second, larger palace was built on the ruins of the old one. This was partially destroyed about 1450 BC, after which the Mycenaeans established themselves at Knossos. The palace was finally destroyed about 1350 BC by a major conflagration. The site it covered was occupied again from the Late Mycenaean period until Roman times. Extensive reconstruction of the Palace of Knossos was carried out by the excavator, Sir Arthur Evans. It was a multi-storey building covering an area of 20,000 square metres. Impressive features of it are the variety of building materials used, and the painted plaster, marble revetment and wall-paintings adorning the rooms and passages. The advanced level of technology attained by the Minoans is also demonstrated by some original architectural and structural features, such as the light-wells and polythyra, the use of beams to reinforce the masonry, and the complex drainage and water-supply systems. The palace is set around a large Central Court, an area used for public meetings. A second courtyard, the West Court, acted both as the official approach to the palace and a ceremonial area. The west wing was occupied by the official rooms for administrative and religious activities, including the Tripartite Shrine, the Sacred Repositories and the Pillar Crypts. The Throne Room is outstanding amongst them, with its lustral basin and the alabaster throne flanked by benches. The most important areas in the south wing are the South Propylon, the Corridor of the Procession and the South Entrance, with the fresco of the Prince of the Lilies. The east wing contained the residential quarters and large reception rooms, the most important being the Hall of the Double Axes and the Queen’s Hall. These rooms are approached by the imposing Grand Staircase. From the North Entrance, a road led to the harbour of Knossos. The North Entrance is flanked by elevated stoas, the one at the west being decorated with the Bull Hunt fresco. A large, stone-paved processional way, the Royal Road, led from the Small Palace and the city to the north-west corner of the palace, where there was an open-air theatral area.